Posted this on "The Library Lady Rants" last year, and thought it should be here instead. I do lots of fox books in November--there are so many terrific stories that foxes tends to get 2 programs, especially since there are several books that involve foxes AND turkeys. One of my favorite stories to do has always been "Mr Bun", as originally told by Heather Forrest--it's on her album "Sing Me A Story" and you can hear a sample of it HERE. Years ago, we turned it into a puppet show and our talented assistant made us a bun puppet. The story is basically a Russian version of "The Gingerbread Boy" and it ends with, you guessed it, a fox. 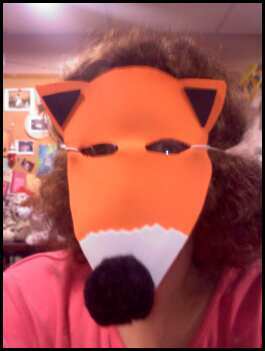 But instead of using a fox puppet, our assistant made me a wonderful furry mask--complete with ears, nose, etc, and I put it on at the end of the show. It's been wonderful for doing this story as a storytelling with puppets thing for many years. And now it's disappeared. Can't find it anywhere in my storage. And I couldn't make another one. Not one like Jason made me. But back then, I didn't have the Internet and now I do. Thanks to a pattern on a wonderful English site called Activity Village I found a "Fabulous Mr Fox" pattern. I printed it and cut it out then, decided I could use it as the basis of a foam mask--like the ones I made this summer for various programs. Not sure I showed those on the blog, come to think of it. This is their finished product. And this is mine, though I haven't added the whiskers yet. Not sure that I want to. If you want to see more details, I've added a slideshow of the mask being made below. But pretty good for someone who can't draw, hmm? 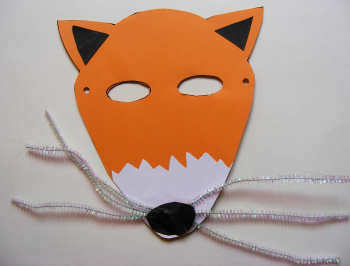 Your fox is more foxy by far! Love the pompom (?) nose! Kids would get SUCH a kick out of this in my storytimes! Thanks for sharing!! Could you please help me with the details of how the mr.bun puppet looked? we are trying to design one for the story....cant think of any patterns. Deepa, he's made of layers of foam, covered with a tan fabric. Shape is like a drum--round with flat top and bottom. He has eyes, a movable mouth and some white yarn on his head sort of like icing! When I use him I put him on my table to "chill", and then turn him around so the kids can see his eyes when the "bun" wakes up. They love that bit. May post a photo here this week if I have time.